Producing a successful spinoff is one of television’s more difficult feats. For every Frasier, there’s an AfterMASH or, god forbid, a “Joey.” Even at its best, a spinoff can feel like an exercise in creative hubris or a craven network cash grab. That feat is doubly precarious when the series in question is beloved by fans and critics alike. There’s no room for mistakes. Expectations are high, and those expectations carry with a ton of baggage. Many viewers will tune in anticipating an extension of the original series. Any deviation in tone or style could spell disaster. Into this breach step co-creators and executive producers Vince Gilligan and Peter Gould with Better Call Saul, the “Breaking Bad” spinoff/prequel starring Bob Odenkirk as fast-talking lawyer Saul Goodman. Breaking Bad is one of the best dramas in television history. To attempt a spinoff of such a perfect series, to feel compelled to add another chapter to such a complete and fully-realized story, takes some real chutzpah. When AMC first announced the development of Better Call Saul back in 2013, it was hard not for me not to see the dollar signs in the eyes of all parties involved. I began to fret that whatever followed would only sully the legacy of a show I loved. But with Gilligan attached, I vowed to reserve judgment. So how’d he do? Pretty good, actually. If nothing else, the show is already a ratings smash. “Uno,” the pilot episode garnered 4.4 million viewers in the prized 18-49 age demographic, making it the best series premiers in cable history. “Uno” opens with a quiet black-and-white montage of Saul’s post-Breaking Bad existence. After the events of the final season forced him into hiding, we see Saul settled in to his new life working at a Cinnabon in Omaha. Cut to his home where he sits in front of the TV wistfully watching a video of old commercials for his law business. This is the life of Jimmy McGill. There is no Saul Goodman yet. The hustle and spark is there, but in the first episode Jimmy is still searching for a way to tap the potential he sees within himself — or, at the very, least he’s searching for a big payoff. “Uno” does a good job setting up the world in which Jimmy operates. The look and feel is immediately recognizable. The bright, sun-blasted color palette, the framing of the shots, the pacing — it all feels both familiar and fresh. This may be the same universe as Breaking Bad, but it’s not the same story. There are even some familiar faces that appear without being intrusive. Jimmy’s future “fixer” Mike (Jonathan Banks) shows up in a minor and comically antagonistic capacity that will likely build as the series progresses. Hot-headed drug kingpin Tuco Salamanca also drops in to provide the main conflict for the first two episodes. The Breaking Bad cameos and Easter Eggs are a nice touch, which have thus far been handled well. I’m sure Gilligan will have more restraint than, say, Bruno Heller’s kitchen sink approach on Gotham. In “Uno,” we get a glimpse into Jimmy’s past with a story about his grifting days in Chicago as “Slippin’ Jimmy,” and watch him work a new hustle. However, the second episode “Mijo” is where things really take off. The fallout from Jimmy’s grift, which fails spectacularly, presents a new opportunity. It’s here, in a tense scene in the desert —a nice callback to a similar scene from Breaking Bad — where we see early elements of his Saul persona start to lock into place. As he pleads with Tuco for his life and the lives of his accomplices, we see Jimmy to discover his inner lawyer. Jimmy realizes it, too. This was the push he’d been waiting for. He reads Tuco, and appeals to his ego and sense of honor, talking down a triple execution to a double leg breaking. In these negotiations, Saul Goodman is born. Armed with this new confidence, Jimmy doubles down on his public defender work. Through it all, you can see the wheels spinning. And when the next hustle presents itself, he’s faced with a decision that will pull him deeper into the world of playing counselor to the criminal underworld, and eventually hurtling into Walter White’s catastrophic orbit. Odenkirk is at home as Jimmy McGill. What may have initially seemed an unlikely bit of casting on Gilligan’s part back in 2009 turned out to be an inspired choice. 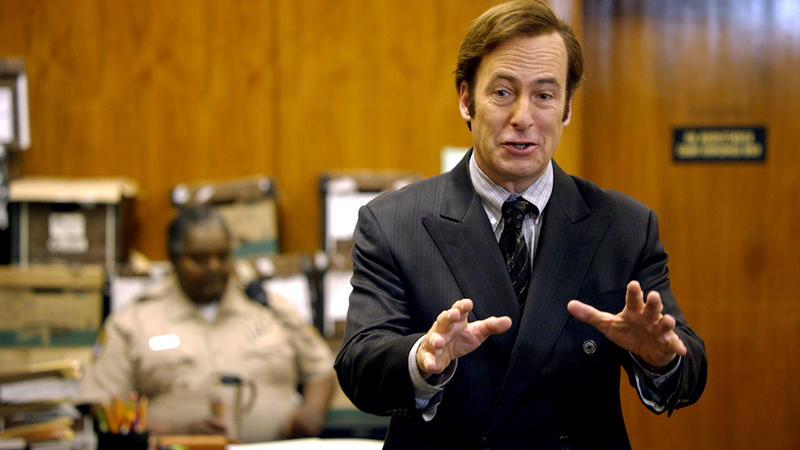 Odenkirk’s comic chops added levity to the often-bleak world of Breaking Bad, like a more competent Lionel Hutz. Better Call Saul is no different. Odenkirk successfully plays up the show’s darkly comic moments. A subplot that looks as though it will run through the course of the series has to do with Jimmy’s brother Chuck, played by the great Michael McKean. Suffering from a yet-to-be-defined illness, though seemingly psychological, Chuck humanizes Jimmy in a way Breaking Bad never really did. Despite his questionable clients and self-serving motivations, Jimmy isn’t a bad guy. He’s not a villain. By his own distorted moral calculus, he is doing good the only way he knows how. Jimmy McGill is a man more at home with the devils than the angels. It’s a natural state he has apparently struggled to suppress all his life. Better Call Saul finds Jimmy at the moment he embraces his true nature, and begins his transformation to Saul Goodman. It should be one hell of a show.